Did you make a resolution this year? If you resolved to break a bad habit in 2017, your journey may not be easy. In fact, breaking habits can be extremely difficult. To help you increase your chances of resolution success this year, take a look at these four tips for breaking a bad habit. Understand the psychology behind habits. What exactly is a habit? According to author Charles Duhigg, habits are loops of repeating behavior made up of three components: the cue that triggers behavior, the routine of that behavior, and the reward that makes it all desirable. James Clear, a behavioral psychology writer, says that most habits are the result of either stress or boredom. By teaching yourself new and healthy ways to deal with those emotions, you may be able to substitute bad habits with much better behavior. Pay attention to your habits. Though it may seem like ignoring the behavior you’re trying to change is an effective way to eradicate it, the opposite effect might actually occur. In fact, author and psychologist James Claiborn encourages his patients to increase the awareness of their habits in order to track what triggers them. “We need to understand the behavior before we can change it,” he said. Next time you notice yourself stuck in a bad habit, don’t ignore it. Instead, try to understand why it’s happening. It’s hard to break a habit. And when your goal forces you to focus on something you’re not going to do (like, not checking your phone at dinner or not drinking three cups of coffee), your brain tends to react poorly to this negativity. Art Markman, a professor of psychology at the University of Texas, said, “You’re just about doomed to fail when you set up your desire to change a behavior in that way.” Instead, he suggests replacing the habit you’d like to break with an alternative behavior. If you’re trying to stop biting your nails, for example, Markman suggests playing with desk toys when you feel the urge to chew. Or, if you’re trying to cut back on sugar, drink water when you feel the craving come on. If tracking your behavior and replacing bad habits with alternative ones isn’t working, you may need to step it up a notch by making your bad habit just a little more painful. Since money is a great motivator for many things in life, set out a jar and place a dollar in it every time you—or someone around you—catches the bad habit in action. If you go a whole day without putting money in the jar, reward yourself by taking one of the dollars out of the jar. Try this for 21 days, and see whether you’ve made progress or just emptied your wallet. Even though it can be difficult, you may need to change your environment if you really want to kick a bad habit. If your resolution is to quit smoking, but you take smoke breaks by the tree outside the building, avoid that tree at all costs. It could be a trigger for the behavior you’re trying to stop. Try switching up your surroundings by using “The 20-Second Rule,” a simple trick from Harvard expert Shawn Achor. The principle behind this rule is that adding 20 seconds to a routine makes it less desirable, while taking away 20 seconds may make it easier. For example, if you want to stop eating junk food, consider moving that food to the back of the pantry. The extra 20 seconds it takes to get the junk food may deter you from eating it. Conversely, keeping books on your nightstand might make it easier for you to reach your goal of reading more at night. 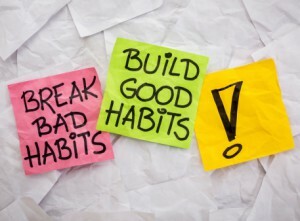 What bad habits are you trying to break? Are you trying to start new, positive habits? Share your tips in the comments section below!